There was a backlog of flights. In the previous couple of days poor weather had disrupted float plane services. Now the pilots were playing catch-up, ferrying fishermen, canoeists and gold prospectors out to the bush. As soon as a plane came in, it was being turned around again, made ready with another load. Our outfitter passed on the information that we should still be good to go first thing in the morning. All being well, the backlog would be cleared and we’d be on the first flights out of Red Lake as planned. It was the start of our Bloodvein River trip, on the Ontario-Manitoba border. We’d spent the previous day on the road from Winnipeg. The day before we’d flown from the UK. After two days of travel, we were ready for the quiet of the woods. There were six of us. We would be paddling tandem, so had three canoes. 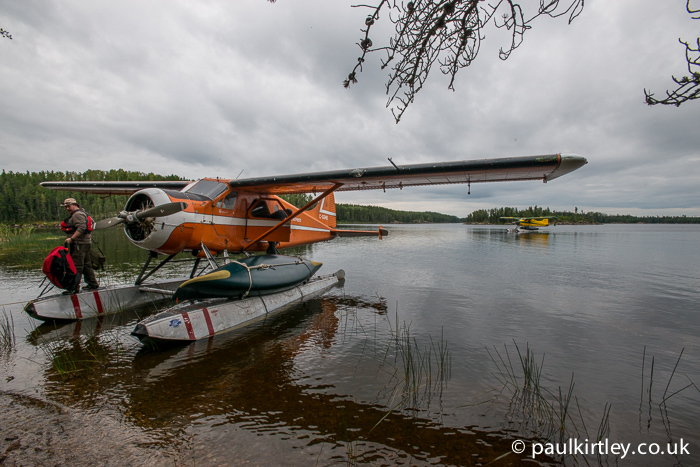 Under current aviation regulations, which permit only one boat on the outside of each plane, we would need three flights to get us into the bush. We were hopeful the backlog would be cleared and we’d get our three flights in the morning. 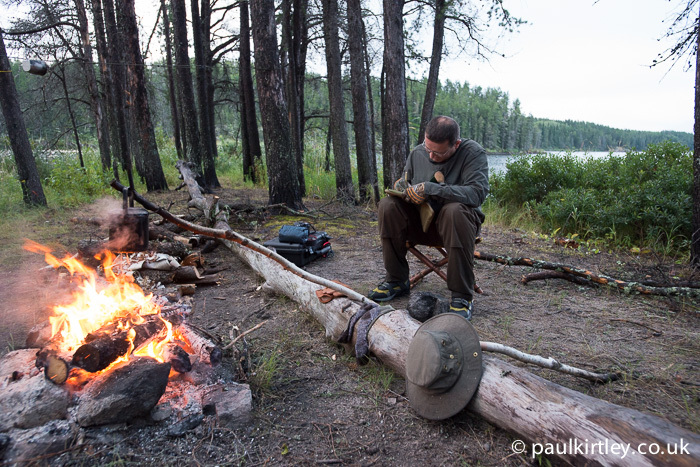 We spent the evening packing our personal gear and group equipment into portage packs. Food was to be collected from the outfitter in the morning. Our dried food was already in barrels. Fresh food was being kept refrigerated until just before we departed. After breakfast, the minibus collected us from our motel and took us down to the outfitter’s shop. Here a friend who lives locally met us and shared a flask of Chaga tea with us. A great way to send us on our way. News came up from the dock that one of the floatplanes had developed a fault. Two planes remained operational, so one would have to make two flights to take us all to Artery Lake. We loaded the food into the van then drove the short distance down to the floatplane dock. Portage packs, daypacks and barrels were carried down to the pontoon. Canoes had already been tied onto the float struts of the two planes. It was time to go. The pilots were keen to get a move on. The weather was forecast to deteriorate again, with cloud thickening and rain expected later. I would be going in the first plane, along with one of the group. Ray Goodwin, the other leader, was going to follow up the rear, in the last plane. Malcolm and I loaded our personal gear, along with one of the food barrels into the vintage de Havilland Beaver. After a long taxi to warm up the engine, we were off. We climbed a few thousand feet into the broken cloud. The pilot had set his GPS but navigated largely with a topographic map, something he wouldn’t be able to do if the cloud thickened. After about 30 minutes, we started descending, circling down towards the target lake, which the pilot had skilfully picked out amongst all the other lakes. A smooth landing saw us approaching a sandy beach on a tree-covered spit of land, jutting out into the lake. The gradual incline of the beach, combined with the absence of rock makes for a good landing spot for a float plane. The pilot cut the engine and the old bird glided the final distance, coming to a halt on the beach. 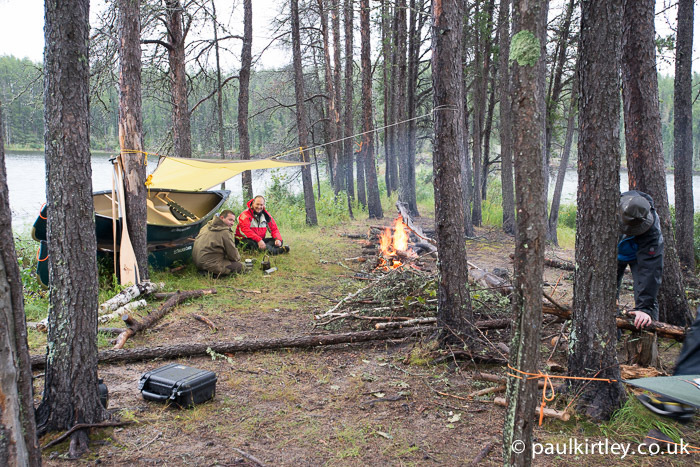 We quickly unloaded our gear, gathering everything together in one spot on the land. We untied the boat and set it on the sandy beach. This staging post was our agreed group rendez-vous. It wasn’t long, only a few minutes in fact, before the second plane could be heard approaching the lake. It came to a rest on the beach near to where we hand landed. I was surprised to see that three members of our group climbed down out the aircraft. At the behest of the pilot, who was keen to keep everyone moving, three guys and as much kit as possible had been loaded into the second flight. Only Ray and some final group kit was to come out on the final flight. As soon as the planes returned to Red Lake, one would turn around and bring him out to our RV point. We made a final check we had everything then pushed the plane backwards into deeper water so the pilot could turn it around. He stood on one of the floats, using a canoe paddle to manoeuvre before climbing back into the cockpit and firing up the engine. Both planes took off one after the other and we watched as they disappeared into the grey sky. We could hear the engine notes for a good few minutes afterwards. 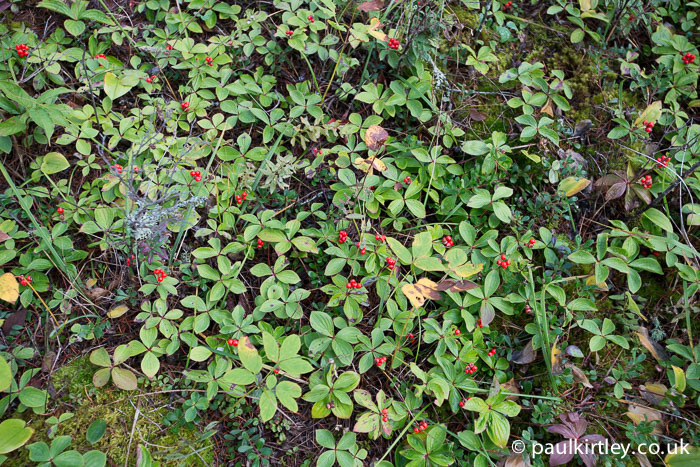 Five of us were in the middle of a huge swathe of northern forest. There was no noise pollution. 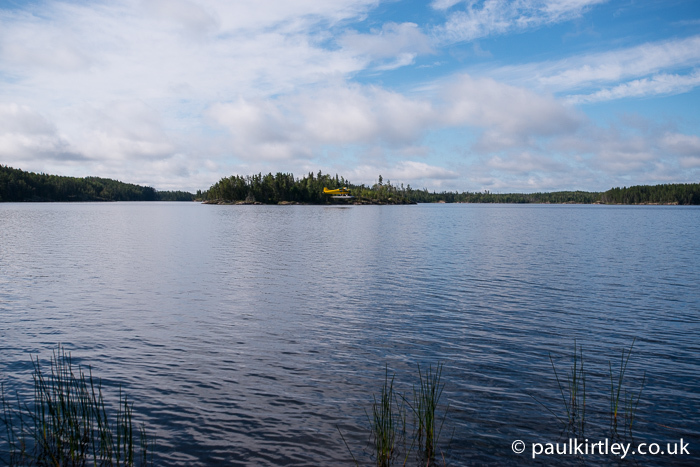 All we could hear was the wind in the trees and the occasional call of a loon, out on the lake. Given the flight time back to Red Lake then back again, we expected to be waiting about 90 minutes for Ray to join us. 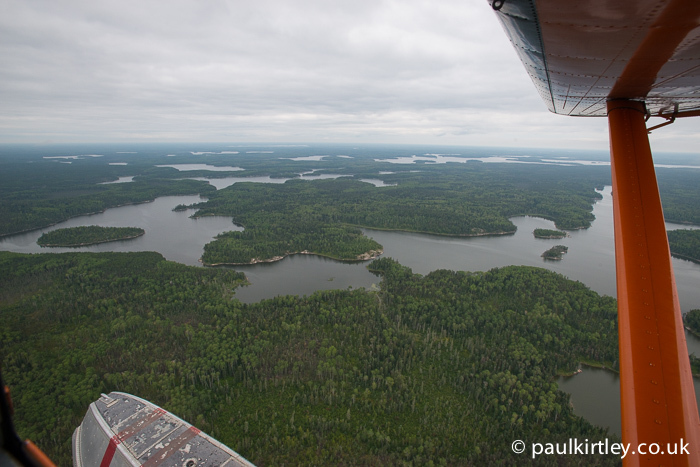 Artery Lake hosts one of the most important rock art sites in Ontario, only a few miles up the lake from where we landed. Our plan was to leave most of our expedition equipment at the staging post, do a half-day trip up to view the rock art, then return, picking up the bulk of our gear and food, before heading into the Bloodvein River proper. So, it was that we sat and waited for Ray to join us. We took to opportunity to have a look around the local area. Myself and one of the others in the group are particularly interested in botany, so we occupied ourselves with studying the local trees and plants. One of the guys had a small billy can in his kit so got a fire going and heated some water for a brew. For the time being everyone was content. 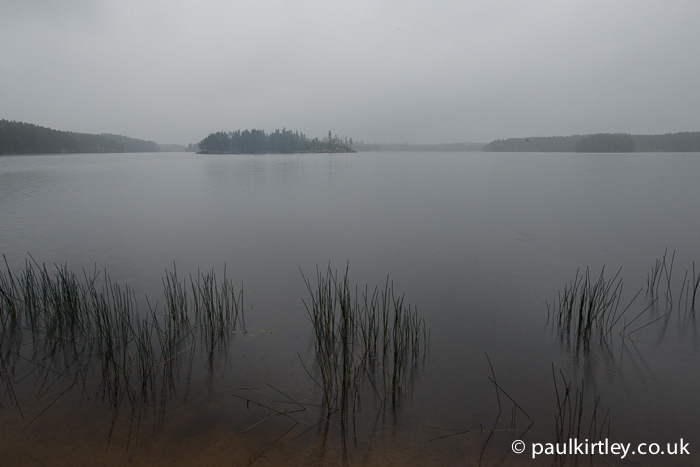 Conditions continued to become more gloomy, however, and as mid-day approached with no sign of Gooders, we pulled out the satellite phone to call Red Lake. Our suspicions were confirmed. On their return to base the pilots had said the weather was closing in and they would not be flying Ray out to us until conditions improved. Ray was stuck in Red Lake until further notice. And we were stuck at our RV point until Ray could fly out to us. As the wind picked up and rain looked likely, it was time to take stock. There were five of us. We had two canoes. We had our fresh food but not our two barrels of dried food. The latter, along with the portage pack containing cooking pots, utensils and other kitchen items, including the group tarp, was with Ray, back in Red Lake. We all had our daypacks, containing waterproofs, warm layers, head-torches, water bottles and mugs. At first I also assumed we all had our portage packs containing personal kit, including, most importantly, shelter and sleeping kit. On checking this, it turned out, however, that as one of the group of three in the second plane had gone to put his personal portage pack into the back of the plane, the pilot had said he didn’t want more weight on board. Personally I would have refused to fly into the wilderness without my gear – a sentiment echoed by an ex-Para in our group – but that’s the voice of experience. In the face of an adamant bush pilot in whom we were placing our trust, I can see why one of the group had paid heed to this. What it translated to, though, given it was early afternoon and the weather still worsening, was that we would likely be spending the night out at the RV point and one of our group had no tent or sleeping kit. 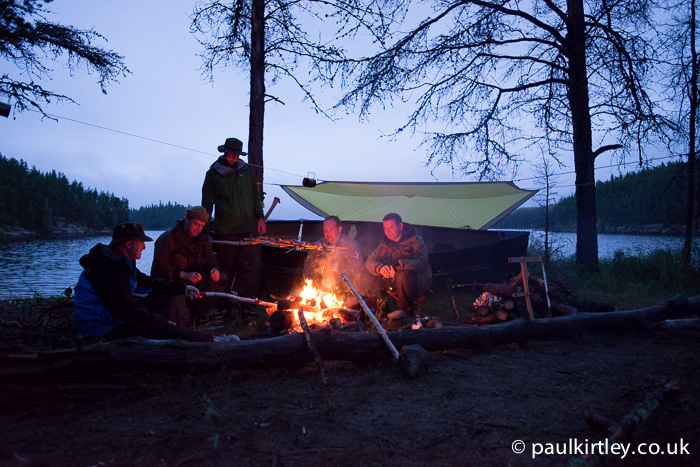 We had no cooking pots or group tarp. We had only fresh veggies and meat. This was starting to feel like a scenario I give to delegates on leadership development courses. Time to utilise STOP. Stop, think, observe, plan. First off, to deal with the deteriorating elements we stacked the two canoes to make a wind-break. One of the group had a small personal tarp, intended for use in conjunction with his tent. 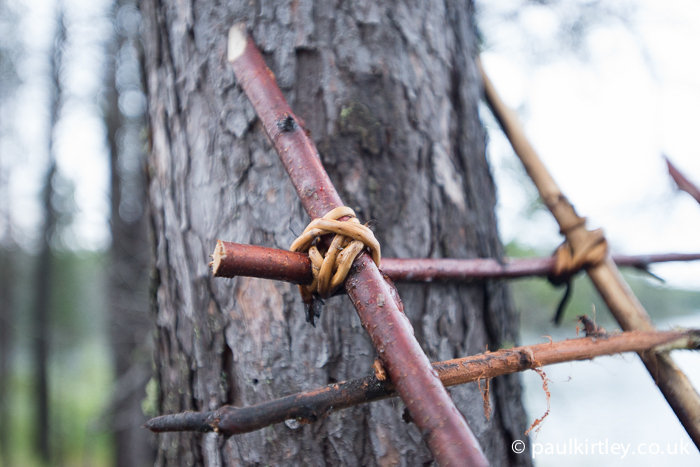 We made use of this, along with the canoes to make a group shelter. Opposite this we built up the fire. We made an effort to bring in plenty of firewood. Some axes came out of packs but I cautioned that we were an hour’s flight from the nearest roadhead and the reason we were in this situation, waiting for Gooders, was that no-one would be flying any planes. Even though we had a satellite phone, it would be a particularly bad time to have an accident with an axe, so they should be put away and only saws used for harvesting firewood. We had one small billy can and most people had metal mugs, so we were OK for boiling water to sterilise it and for hot drinks. The main brew kit was with the dried food but there were plenty of things we could brew up with in the bush nearby. We had one Katadyn pocket filter too, so we were fine for producing drinking water if boiling with the small pot was not producing sufficient quantities. It was then time to sort out shelters and the problem of one of our number having no tent or sleeping kit. One member of the group had a small two-man tent that we could squeeze two into. This was a small space that would stay relatively warm with only the body warmth of two people. This was a good start in keeping our friend warm overnight. We then each looked in our personal kit and pulled out spare warm layers, jackets and the like that could be used to create a sleeping mat and a covering for our kit-less companion. There was plenty handed over and it turned out he had a great night’s sleep. Onto our cooking predicament. Our original plan was to have some fresh food for the first days of the two-week trip before moving onto solely dry mixes (e.g. pan breads, bannock, pancakes) and dehydrated foods (from rice and pasta to dehydrated veg to whole freeze dried meals), along with granola and the like. We had only the fresh food with us, however, so this meant more of the fresh food would have to be consumed initially. In terms of meat, we had some steaks, pork loin and lots of sliced bacon. We also had plenty of fresh veg, including broccoli, carrots and potatoes. But remember we had no cooking pots other than the 1.5 litre billy can. We had no fry pan or grill either. 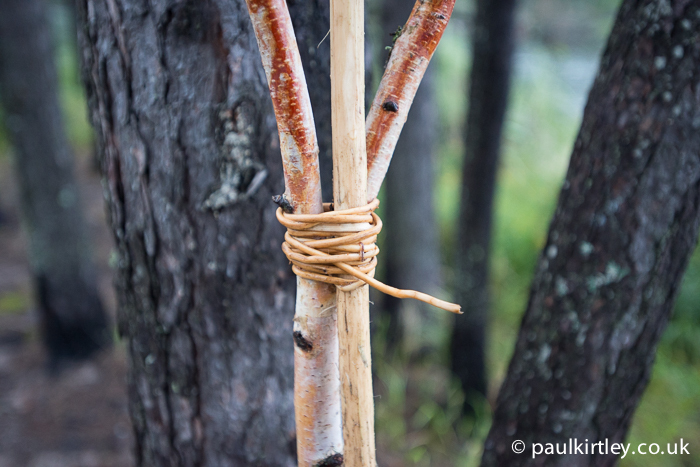 On the Intermediate Wilderness Bushcraft Course I teach in the UK, we follow on from the core skills taught on the Elementary Wilderness Bushcraft course. One focus of the Intermediate is reduction in dependence on equipment and increased reliance on techniques which make use of natural materials harvested from the bush. Amongst other skills, students on these courses learn to cook a variety of food types without cooking pots. One of the old woodcraft and camping techniques I teach is the manufacture and use of a broiler. This was the solution we needed for cooking the meat we had with us. I set about collecting the materials needed. A green Y-stick with a long handle, plenty of thin pliable green sticks for cross members and something for bindings. Given the number of coniferous species in this area, I opted for collecting spruce roots, which I unearthed then removed the outer bark from. These stripped roots were then split for use as bindings. Once manufactured, we had everything we needed to cook our evening meal. 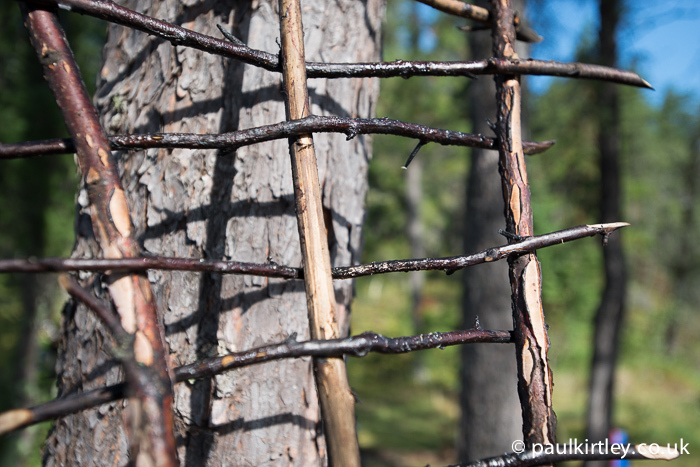 Spruce roots used to bind the central piece of the broiler in place. 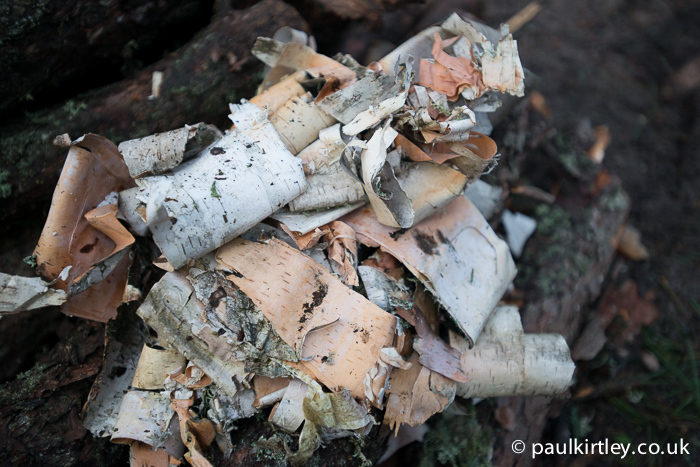 Photo: Paul Kirtley. Spruce binding detail. Photo: Paul Kirtley. The broiler after several uses over the fire. Photo: Paul Kirtley. Even though the wind was blustery and the rain at times persistent, we were sorted and had plenty of daylight in hand. We were now able to get comfortable, relax and wait for the poor weather to pass. We hoped this would be the next day and that we’d be able to proceed with our journey. Leigh decided to make a camp chair, which he duly did using much of the miles of paracord he seemed to have brought with him. Despite the mickey-taking, we were secretly envious of his new perch. Leigh writing his journal, perched on his chair. Photo: Paul Kirtley. The next morning, we cooked bacon on the broiler and used the tortilla wraps to make a bacon sandwich of sorts. The wind had changed direction and the cloud base was lifting. By mid-morning the sun was breaking through and we heard the unmistakable drone of a float plane, which slowly grew louder. Then, almost taking us by surprise, a yellow plane swooped over the dark green trees to the left of the bay in front of our camp and landed on the lake out of sight behind the trees to our right. The peace was shattered. Ray’s ride taxied its way to the sandy beach and a smiling face beamed from the passenger seat. Untying his canoe from the plane, Gooders was happy to be out with us and we were happy to see him. Photo: Paul Kirtley. It was good to have the full group re-united again. We had a long journey ahead of us but the first 24 hours had already shown that we had a strong group who would pull together and overcome difficulties. Everyone had looked out for one another, pooled resources, shared personal items and just got on with things. This combined with some bushcraft knowledge and flexibility of mind had meant that waiting for Gooders had been only a minor inconvenience rather than a wilderness drama. Great story Paul, I’m glad that you guys all pulled together and overcame the problem. Although the writing and photography are top notch (as per usual) I think on this occasion what is not said, what is between the lines, is perhaps even more powerful. So many people instantly assume wilderness adventures will follow a prescribed route, A to B to C, when, in reality, despite the best of planning, this is not always the case. To stay calm, level-headed and move along – turning potential problems into adventures – this is a true skill. 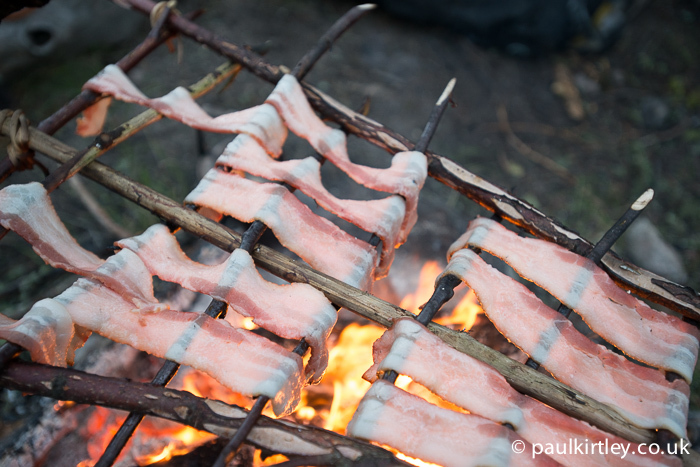 I admit – the photo of the bacon may also have made my mouth water. Thanks again – really enjoyed reading this. One day I hope to head out on a similar trip myself. As my life moves in a different direction to the one it seemed to be heading in, I find myself thinking more and more of wild places (but perhaps not alone – which is odd, for me) – and this piece only serves to enhance those thoughts. Hi Alex, thanks for sharing your thoughts on the above piece. Very well put. Very well said! Quite often, the trips that have the biggest problems to overcome are the trips that I remember most fondly afterwards! I have been reading your blog with increasing detail, as you can imagine. Your “Bloodvein River Trip – My Personal Gear”, “A Personal Wilderness First Aid Kit: What to Include?” and others have been particularly useful as i plan, prepare and practice for this very journey with you and Ray. This was the perfect article to read. I am leaving for a short adventure tomorrow in the Netherlands with my dog. Thanks! Enjoyed reading this post. It may seem an odd thing to say, but I bet you all enjoyed the challenge. I would love to do a trip like that, maybe one day who knows. Hi Adrian, yes indeed. Everyone enjoyed the challenge. It set the group up very well for the rest of the trip too. I really enjoyed the story, believe me, been there, done that, and as long as you think before action things should work themselves out, but it goes to show that even well laid plans have upsets and set backs which can potentially turn out to be serious. I agree with Para mindset, only be prepared to go with your kit or at least to be comfortable with what you have on you. Now that was a well done story. Full of good information a bit of suspense and great pictures. Great read Paul. I’ve just bought my first canoe and looking forward to enjoying some uk based adventures! I’ll be looking for a copy of Gooders book to help me along the way! I’m glad you enjoyed this. It’s great to hear that you have just bought your first canoe. Here’s to you having some great adventures in it. You should definitely get a copy of Ray’s book. Also, if you ever need any instruction to take your paddling up a notch, his daily rates for 1-1 tuition are very reasonable. Yes, that’s true. It was well within our capabilities of dealing with but it’s always good to share when things don’t go to plan and how we resolved things. There is a tendency for people to only highlight to things that go well or perfectly, particularly on blogs and social media. TV, on the other hand – particularly outdoor based, so called “reality” shows – increasingly tends to trade in false jeopardy – Fred Bloggs has forgotten his spare socks… WILL HE SURVIVE??? As always good to hear from you.